It is soft, sweet and full of the bean flavor. 1. Put Gypsum Powder and Corn Flour into water, mix well. 2. Pour Soya Milk into a pan and bring it to boil with medium heat. 3. Pour the mixture into the large bowl. 4. Put the Soya milk into the large bowl immediately. 5. Cover the clean towel and put the lid on. 6. Don't move or stir it. Let it set for 30-45 minutes. 1. Put all ingredients into food mixers and mix it for a minute. 2. Freeze Tofu Fa and mango sauce for an hour. 3. 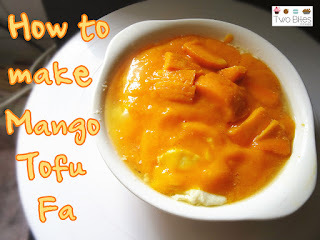 Add some Mango sauce on the top of Tofu Fa and serve.